Two years ago, the South Asia Olympic Council granted Nepal the hosting rights of the 13th South Asian Games. But the bi-annual event, originally scheduled for this year, has already been pushed back three times--partly because of the damage inflicted on the existing sporting infrastructure by the 2015 earthquake and largely due to the snail-paced development of the new and existing sporting facilities. The games’ management committee, headed by Sports Minister Jagat Sunwar, has announced a new date: September 2019. But the volume of outstanding projects and bureaucratic hurdles exude little confidence on whether Nepal can ever pull off another South Asian Games, let alone on the newly proposed date. Instead, Bista points to three separate entities--and reasons--as the stumbling blocks for the country to host the games on time: a lengthy bureaucratic process, dispute in Nepal Olympic Committee and budget allocation by the government. “Our bureaucratic process consumes a lot of time, mostly with paperwork. All the groups concerned, including sports governing agencies and the Olympic Committee, need to realise that and find a way to fast-track such processes for swiftly releasing the funds,” Bista said. The National Sports Council had demanded a budget of Rs2.13 billion this year to develop infrastructure, but the Finance Ministry allocated only Rs1.13 billion. According to the council, the total cost for hosting the games would cost nearly Rs7 billion, which includes purchasing to sports equipment and gears and the Rs 250 million for preparing Nepali athletes for the event. What is making the process even worse is the dual existence of the Nepal Olympic Committee as the power struggle between former president Rukma Shumsher Rana and incumbent chief Jivan Ram Shrestha continues to stall the committee’s work. The Supreme Court has legitimised the Rana-led committee, while Shrestha enjoys the backing of the International Olympic Committee and Olympic Council of Asia. This, in turn, has created a quagmire in the top echelon of national sports. While the government cannot defy the court verdict, only the Shrestha-led committee can co-ordinate Nepal’s participation at international sporting events. “Until the Olympic Committee issue is sorted out, we cannot move ahead with our preparations,” said Bista. The country’s sports authorities have planned to stage the regional event in Kathmandu and Pokhara. 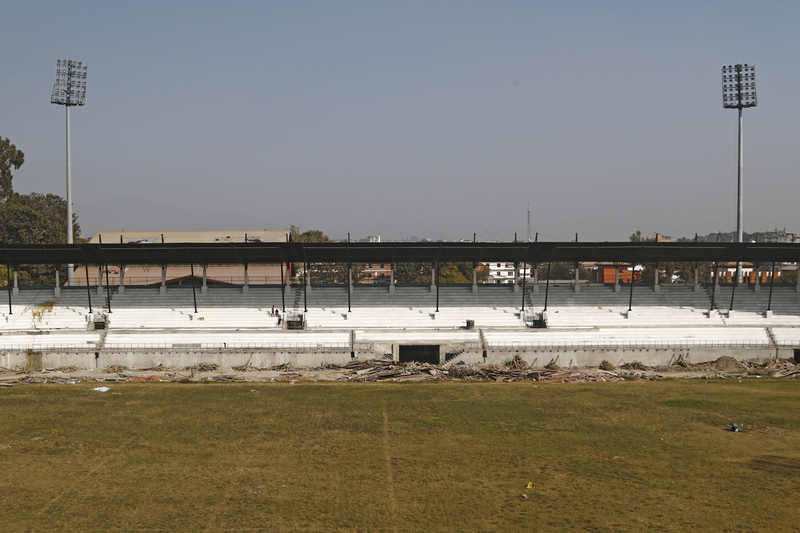 Renovation of the Dashrath Stadium, which was severely damaged by the 2015 earthquake, is currently under way, while the construction of Pokhara Stadium has not started. Dashrath Stadium, the country’s only international-standard stadium, is scheduled to host the Games’ opening and closing ceremonies. Retrofitting of the major structure was completed a year ago and only minor construction work, including renovating a portion of the parapet, remains. The rebuilding of the roof and installation of seats on the VIP parapet are also under way. The 30,000-capacity stadium in the popular tourist destination is scheduled to host women’s football. However, having demolished the old structure nearly a year ago, the council has yet to find a contractor to build the new stadium with the Games’ revised inauguration date less than a year away. The Chinese government said it would help lay a new athletics track at the Dashrath Stadium, in addition to providing a new scoreboard, sound system and restoring floodlights it had installed for the South Asian Games in 1999. China has also assured that it would give a facelift to the shooting range and swimming pool it built at Satdobato the same year. 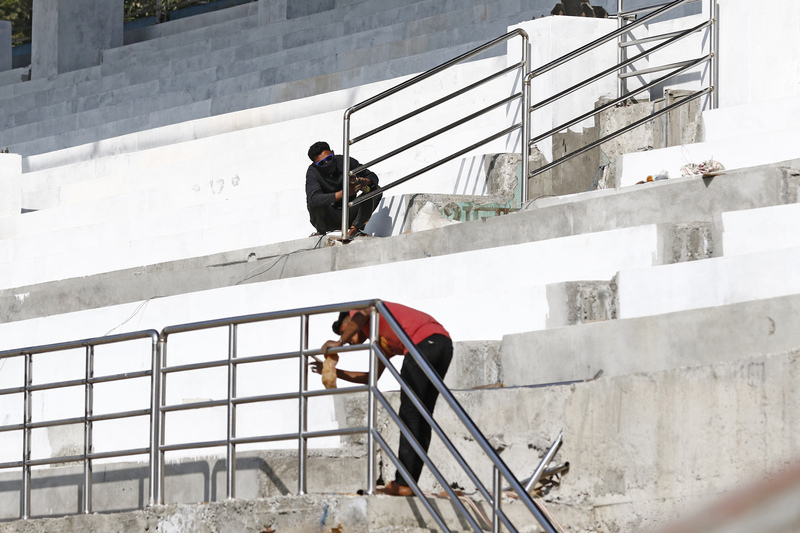 Bista insists the Dashrath Stadium will be completed in two months, and that Nepal will be ready to host the event even if the stadium in Pokhara is not completed on time. “The Armed Police Force’s Halchowk ground, the All Nepal Football Association ground at Satdobato and the Nepal Army ground can be good alternatives to the Pokhara Stadium,” Bista said. In an interview with the Post, Sports Minister Sunwar was adamant about hosting the event in September but offered little clue—and a vague comment—on how the current administration could make that happen. “Hosting events like SAG is a matter of national pride and everyone must be serious to make it happen,” he said. If Nepal pulls it off, it will be the third time that the Himalayan nation will be hosting the regional games after the inaugural meet in 1984 and then in 1999. Nepal plans to include up to 27 disciplines for the 13th edition of the games, including paragliding which will make its debut in the event. In August, paragliding brought Nepal a historic silver medal at the Asian Games in Jakarta. As the host, Nepal can choose two sports for the upcoming games and it has decided to bring back karate and golf which did not feature at the last event held in Guwahati, India. Inconsistency of sporting events like the South Asian Games has demoralised athletes, and some, like national footballer Bikram Lama, says the uncertainty over whether the country can hold an international event could force players to desert the game altogether.